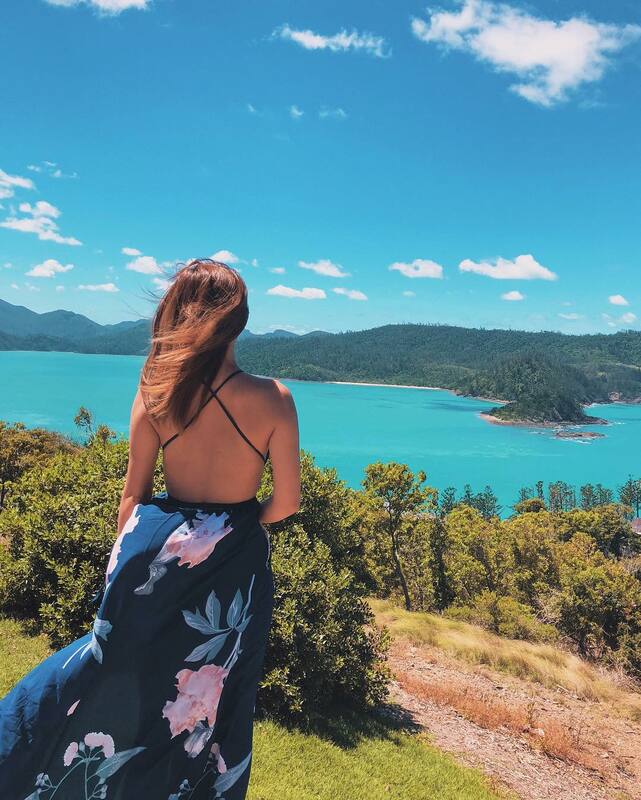 A shot heard around the influencer world was fired on Friday (13 Apr) by a jewellery brand owner named Trixie Khong. She wrote an exposé about popular influencer Elaine Jasmine (@xelainejasmine), fresh-faced star of the new Toggle drama, StarCrossed. 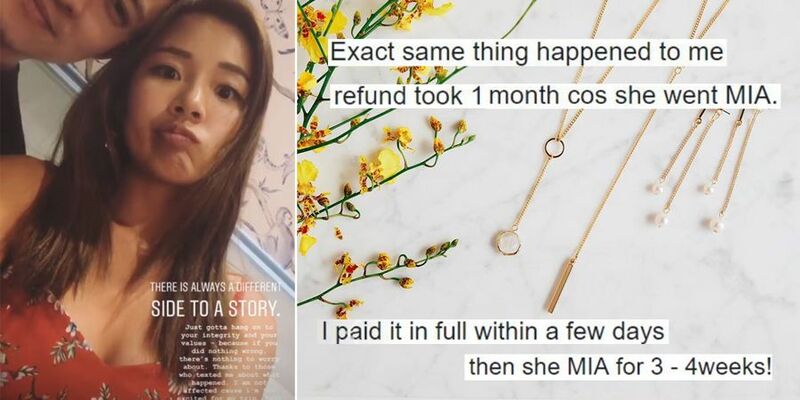 Ms Khong alleged that Elaine accepted her jewellery, and full payment in exchange for three sponsored Instagram posts, only to be uncontactable for “3-4 weeks”. As the post became viral, multiple business owners stepped out with their stories about Elaine’s supposed “unprofessionalism”. Elaine has since issued a formal apology in response to the allegations. Here’s Ms Khong’s post in full. 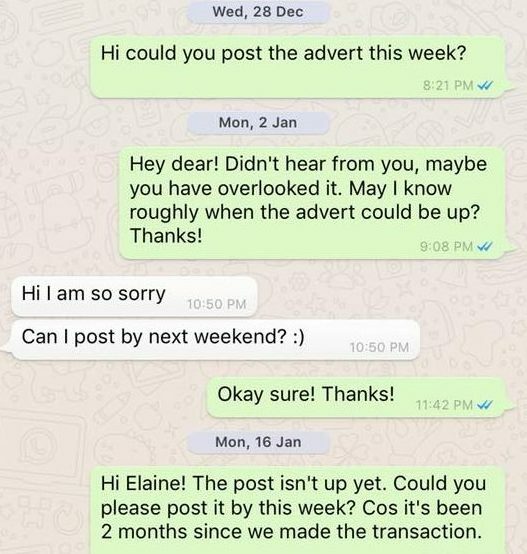 Ms Khong claims she contacted Elaine to do three sponsored posts on Instagram. Everything was hunky-dory till Ms Khong paid Elaine in full “within a few days” and sent over her products. 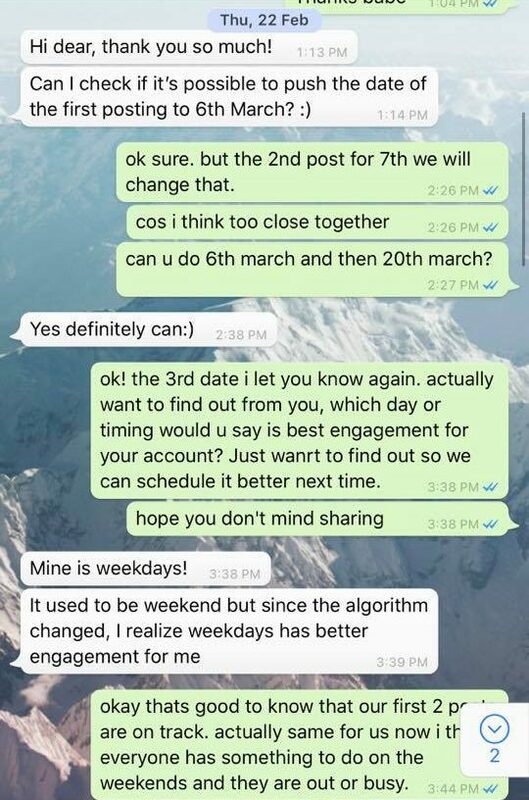 Elaine then allegedly went “MIA for 3-4 weeks”, although she had suggested shifting their first post to 6 Mar. 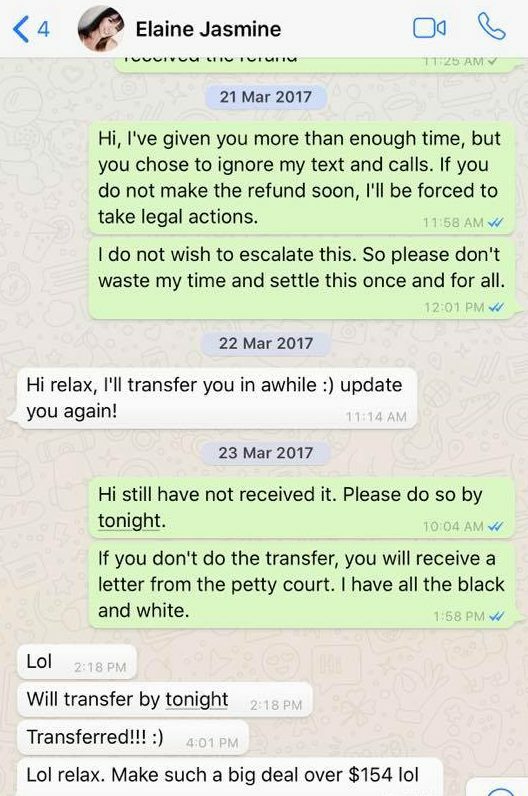 Ms Khong claimed she asked for her money and products back via text and email. So she commented on Elaine’s Instagram account, to which Elaine replied that she would pay Ms Khong back soon. Presumably, this didn’t happen. 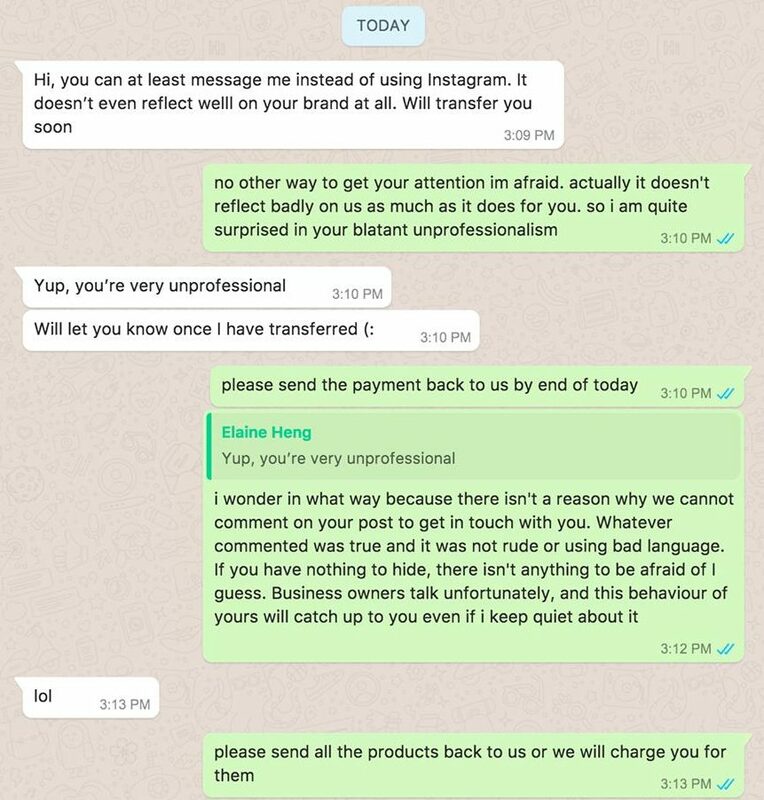 Ms Khong then used her brand’s account to comment on Elaine’s latest Instagram post about “the truth of the money and products owed”. This time, Ms Khong immediately got a text back via WhatsApp. The owner of By Invite Only proceeds to caution other brands from working with @xelainejasmine due to her “unprofessionalism”. She also mentions that not all influencers are like her, and for other business owners to PM her if they need recommendations. 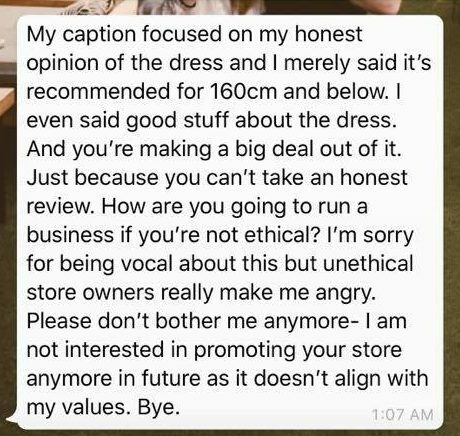 Ms Khong asks readers to tag other brands, warning them of the risks of working with Elaine. A quick glance at the comments section of Ms Khong’s post revealed something surprising. There were are least three other netizens who shared ‘similar’ stories of alleged “unprofessional” behaviour from Elaine. 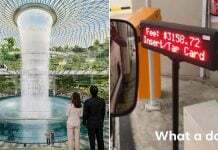 One netizen alleged that Elaine delayed posting their agreed ad after two months, although payment of $154 was made to her. Elaine’s quoted as saying “Lol relax. Make such a big deal over $154 lol” in screenshots of their conversation. Another person claimed that Elaine “defamed” her brand after receiving a dress that was “too short” which “exposed her buttocks”. Finally, one user posted a screenshot of Elaine calling her out for being “unprofessional” and “childish” after “resorting to flaming [her] online”. 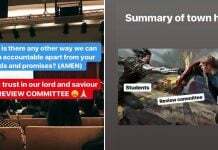 In response, Elaine requested that Ms Khong remove the viral post and incriminating screenshots as she did not wish to “start a saga”. 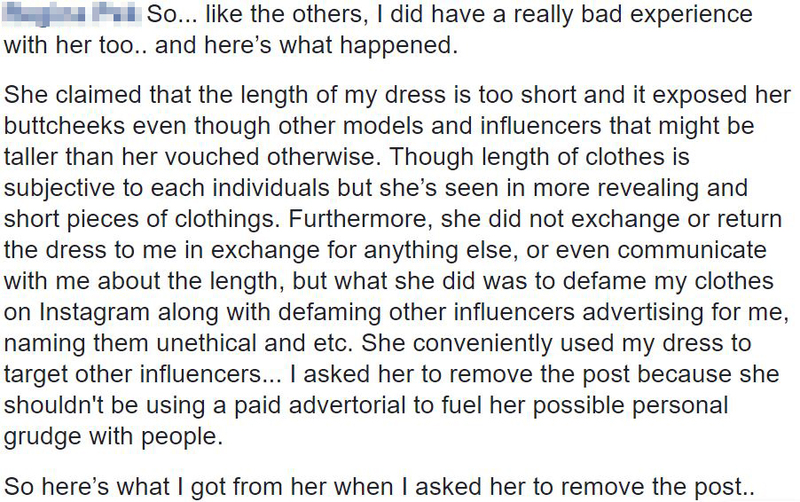 The influencer explained that she didn’t post on Instagram as promised, because she didn’t like the “quality of the products”. Elaine emphasised that she did not “push products” which she “didn’t like” to her followers, and that she would provide a refund to Ms Khong. 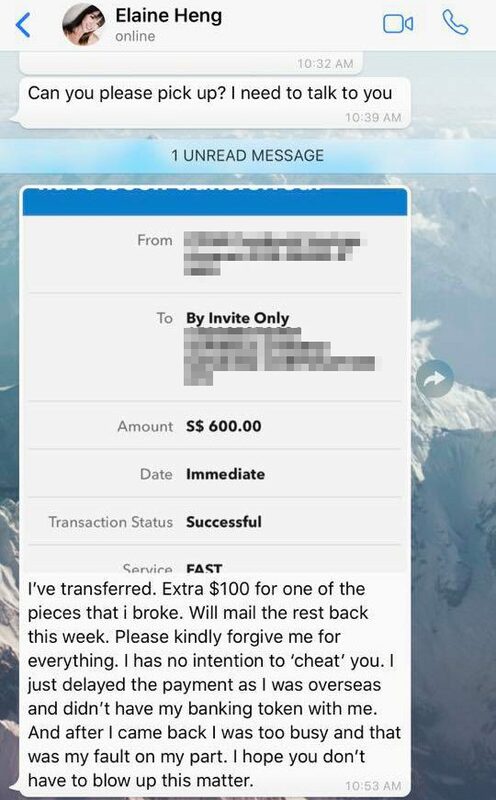 Which she did, and included an additional $100 for one of the pieces that she broke. Elaine also promised to mail all the jewellery back to Ms Khong, apologising for delaying payment as she was overseas. She explained that since she had no banking token, she was unable to transfer the money previously. The influencer acknowledged it was her fault for forgetting as she “was too busy”, but stated she never had the intention to “cheat” anyone. Unfortunately, this wasn’t the end of the matter. In an IG Live video on Saturday (14 Apr), Elaine saw fit to explain the ‘true story’ to her followers, while eating a bowl of instant noodles. She initially refrained from talking about the issue as she did not wish to “stoop to their level” or defame them online as she felt “it was very childish”. But since they were on the topic, she decided to clear the air. 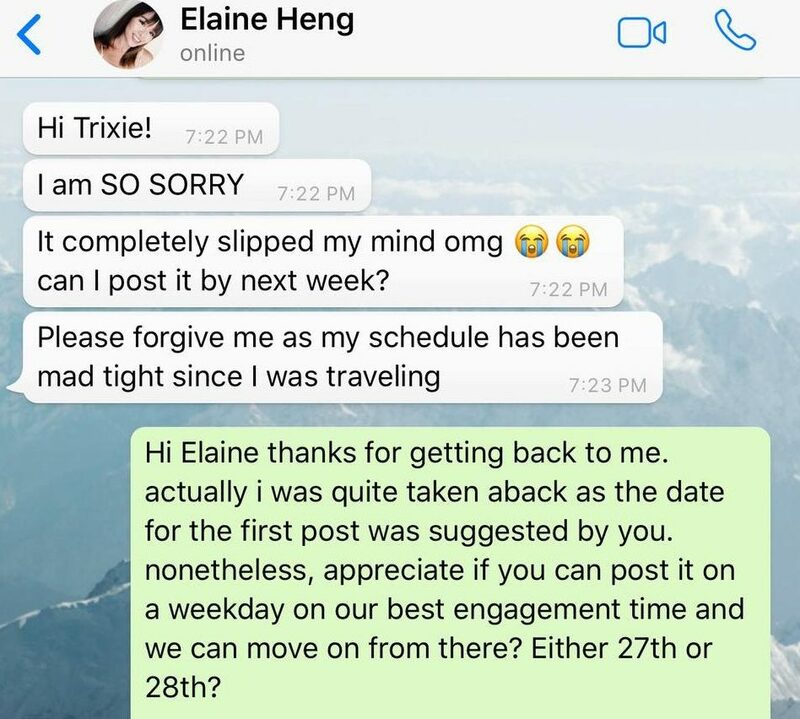 Elaine confirmed that she and Ms Khong had agreed on three Instagram posts before she flew off. However, upon receiving the jewellery, she realised that they were of a “very poor quality”, as compared to the “wonderful pictures online”. She shared that the pieces were “flimsy” — one of the earring’s hooks was even bent when she received them. As she “valued the trust” her followers had in her, she decided against promoting By Invite Only‘s jewellery. 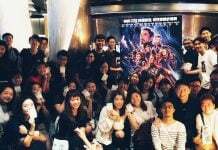 And explained that it would be illogical to recommend something she “doesn’t like” or is of “such a bad quality” to her fans. 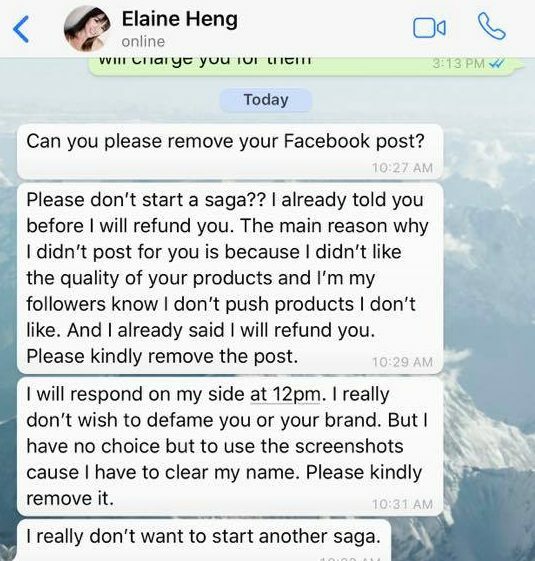 Elaine claims she told Ms Khong that she wouldn’t be posting about the products, and arranged for “a refund”. 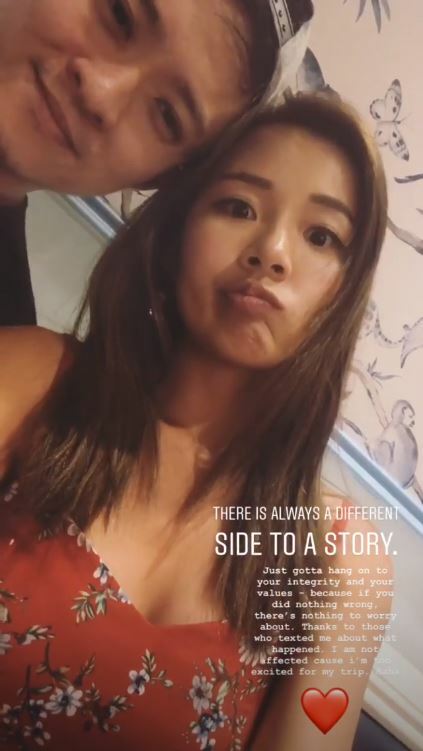 However, after Ms Khong gave her the bank account deets, Elaine admits that it was “her fault” that she did not immediately do so, as she was “rushing for her Australia trip”. After her trip to Australia, Elaine admits that she forgot to make the transaction and flew off to Bali again for 2 weeks. During which, she barely had any access to Wifi for three days on Komodo Island, making it impossible for her to reply to Ms Khong’s chasers. 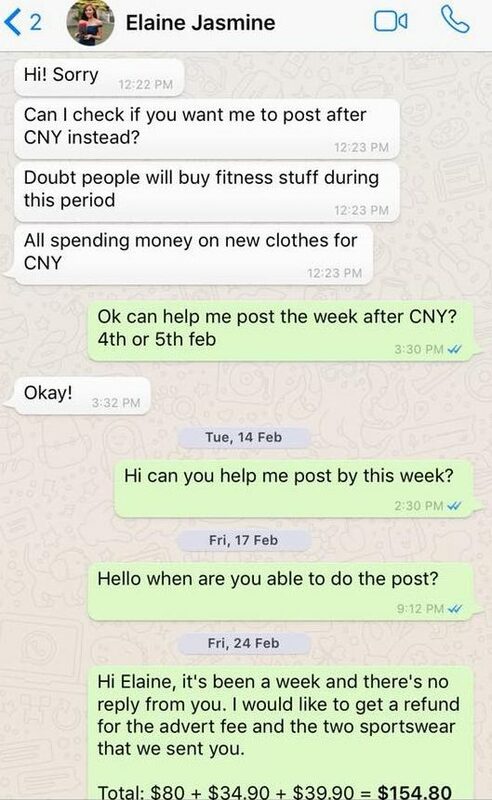 In that interval, Elaine says that Ms Khong used her brand’s Instagram account to post “weird comments” on her pictures, which she was forced to delete. She gave examples of comments posted like “you’re fake”, “you’re such a cheater” and “stop cheating people’s money”. Elaine concludes by saying she only chooses to use her social media account to “spread positivity”. 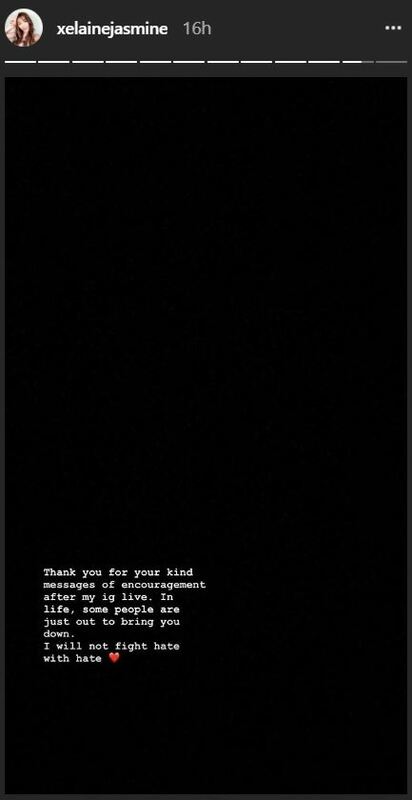 Despite claims she has photographic evidence of the bad quality of the jewellery received, Elaine says she’s chosen not to post them to avoid creating “bitter feelings” or making a big deal out of the matter. Whichever side you’re leaning towards, the fallout from this spat already has far-reaching consequences. At least according to Elaine, whom we’ve since reached out to. She claims that someone has shared her personal phone number in a screenshot online — leading to her receiving at least 40 unwarranted messages and calls from strangers. Of course, that’s not to say that Elaine’s completely absolved of all blame in this unfortunate incident. She has, after all, already admitted her mistakes in this case. As for the other allegations flying around, we hope that the parties involved will come to a resolution soon. Featured image from Elaine Jasmine, By Invite Only, Facebook and Facebook.